Hey, this is just like Smoking Gun, except this website isn't owned by a corporation. And the documents I'm presenting here are nowhere near as lurid and tantalizing as celebrity mug shots. But I think they're interesting and ought to be made available. As I arrived before the start of the groundbreaking at 90 Morton Avenue, my Albany County Legislator, Luci McKnight, with papers in her hand, greeted me with great enthusiasm (photo at right.) 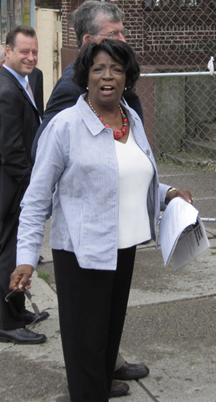 The papers in her hand are documents pertaining to the long and difficult task of transferring parcels of land along Morton Avenue from Albany County to the City of Albany and to Albany Housing Authority (AHA.) Before any construction could begin, the City and AHA had to have solid undisputed ownership of each property. That long process can be glimpsed here. Why are such transfers difficult, why do they take years? I've heard many a concerned citizen and many a City official ask that same question of County officials. I have yet to hear a satisfactory answer. The reason Albany County ended up owning much of the land along lower Morton Avenue is because that's what happens when you don't pay your taxes for three years in a row. The County seizes your land in lieu of back taxes. Not the City, the County. I've heard that the City of Albany and only one other small municipality in New York State have this arrangement with their respective County. Everyone agrees it's a bad system because tax delinquent abandoned properties end up rotting in legal limbo. In the past, the County has had no interest in rebuilding the South End of Albany, so they usually off-loaded these abandoned properties at auction for as little as a few hundred dollars. All too often the buyers have been out of town bogus "investors" who bid on and purchase the properties sight unseen. But the lower Morton Avenue properties had been so mistreated that by the turn of the century the County couldn't even give away these parcels, thus they still owned them. The last active owners of these properties were the worst kind of absentee slumlords, the sort of owners who rent to and exploit the worst kinds of tenants, concentrating such people all in one neighborhood. These slumlords rarely bothered to effect repairs to the buildings, and until very recently the City of Albany did not enforce building codes in this neighborhood except incidentally. In the other words the out-of-town slumlords "milked" the buildings for profit until the buildings were worn out. Then they abandoned the buildings. This was fine with City Hall, in fact that's pretty much what three successive administrations in a row have had in mind. Abandonment. These papers show us that certain concerned persons have been working to change this policy during the past decade, and in the last five years Mayor Jennings has reluctantly let these plans for renovation go forward. Luci told me that she archives County generated paper about the South End. "I'm a historian, I keep everything," she told me. Since collections of records of the South End for the last fifty years are very scarce, Luci's collection of County paper may become very important in the near future. When Luci is finally elected to that big All-County Legislature In The Sky, we will have to make a room at Howe Library to house her legacy. Click here to dowload pdf of the documents. The papers are pretty much self explanatory.